Here are the first of the gowns! Doesn't "Patricia" look a lot like the one Mom made for us? 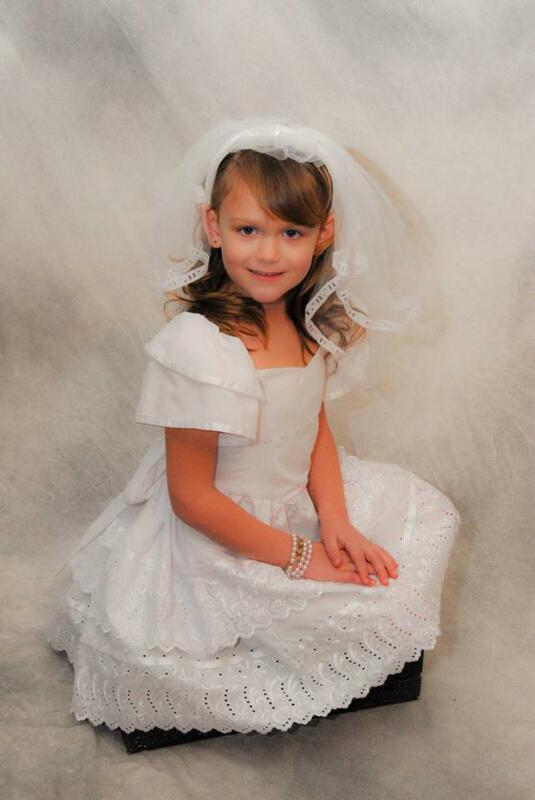 "Patricia" sets the standard for all of the First Communion dresses to come! I can only say that this dress is MAGNIFICENT! Mom made it, just as she made the first one over 50 years ago. She just finished it, and I was almost brought to tears when I first saw the completed product. What memories it brought back! Susan, Connie and I all wore it, as did our daughters, Heather and Lindy. Isn't that what an heirloom truly is? 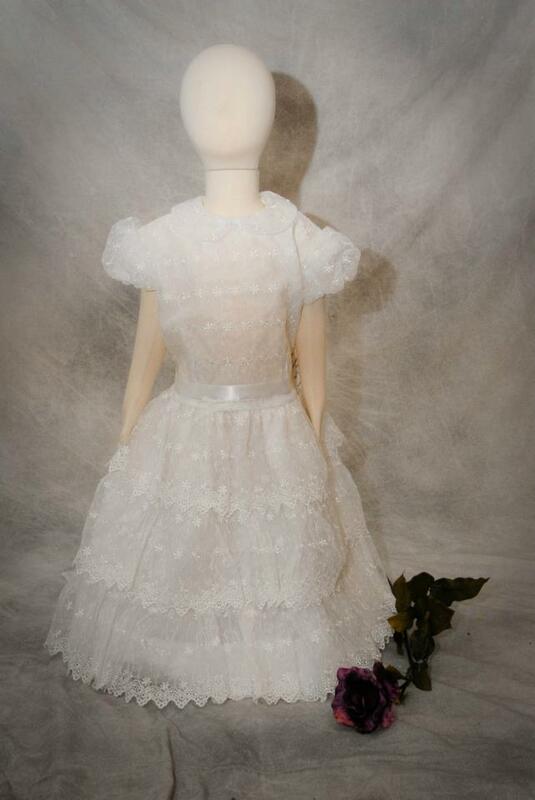 Made from a beautifully embroidered organza, it is underlined for "body", giving it a luxurious weight and feel. No slip is needed! 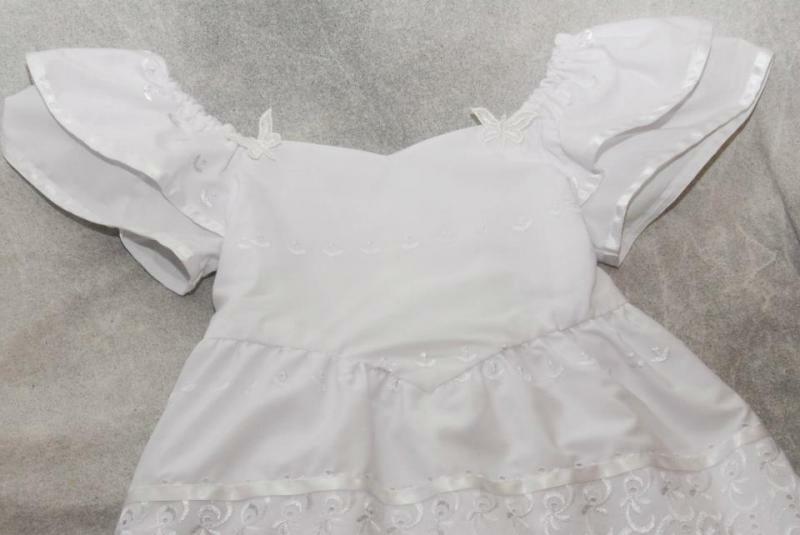 The ruffles of the skirt are lushly full, complimented by the simplicity of the bodice and small, puffed sleeves. A tiny rosette is pinned in place at the collar and can be removed should you care to add a pearl necklace or Cross as an accessory. As always, there is a tiny butterfly....our signature! 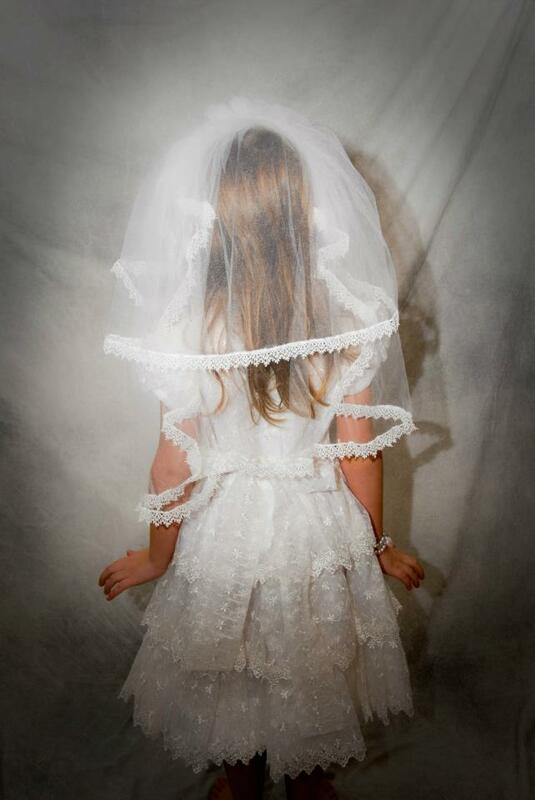 May your child and one day....hers....wear this lovely gown with pride. No other child will have ﻿one quite like it! 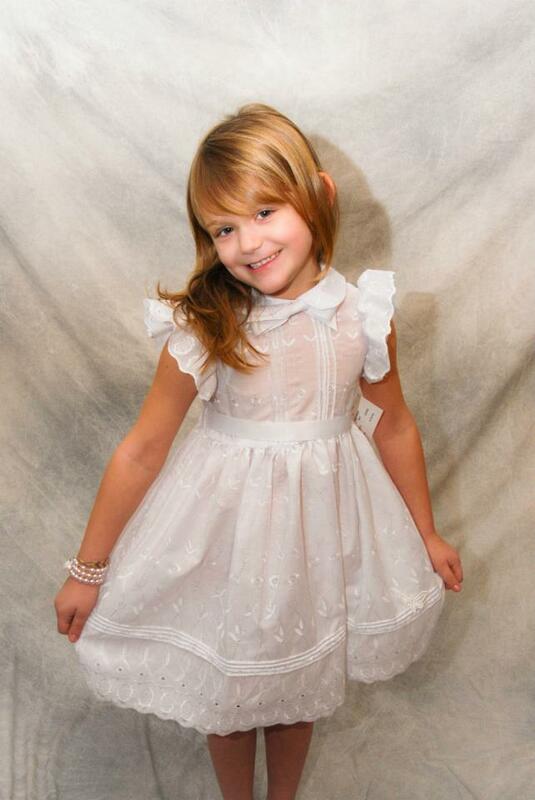 "Susan" features a lined, fitted, shaped front bodice with a darling sweetheart neckline. A full, be-ribboned (is that a word?) 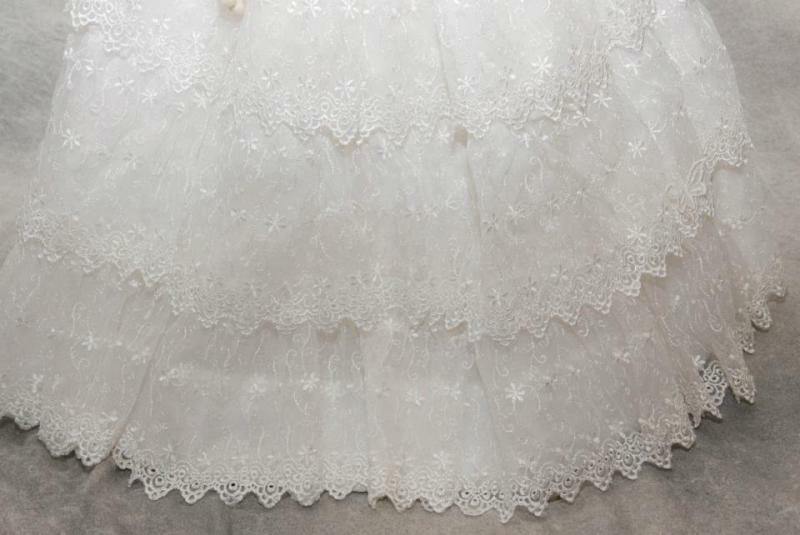 skirt has gorgeous embroidery all along the hem lines of both ruffles. 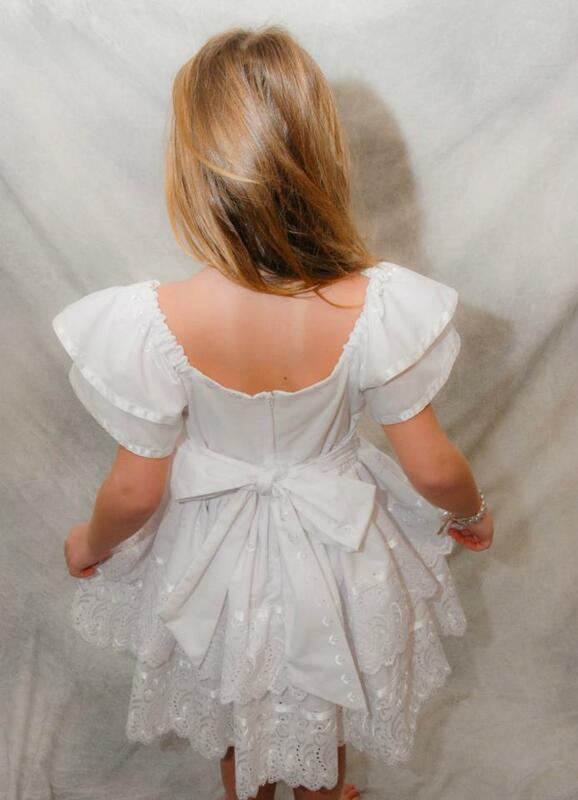 Tiered cap sleeves are also trimmed in ribbon and a big, full bow adorns the back! 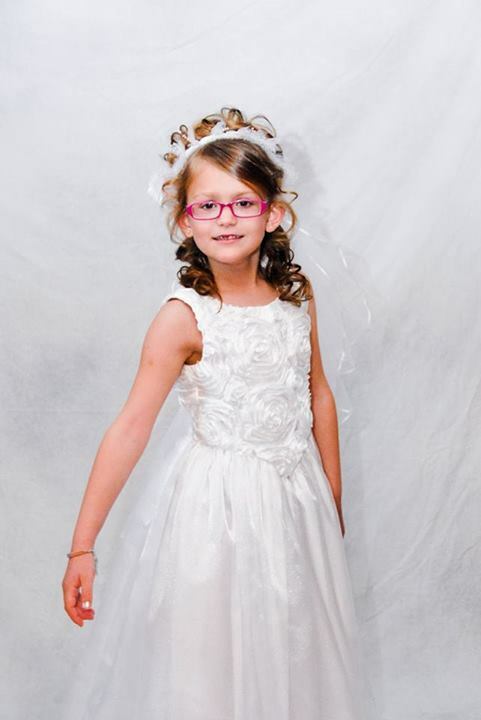 As with all of our gowns, a butterfly has found it's way onto the little dress, framing the neckline beautifully! 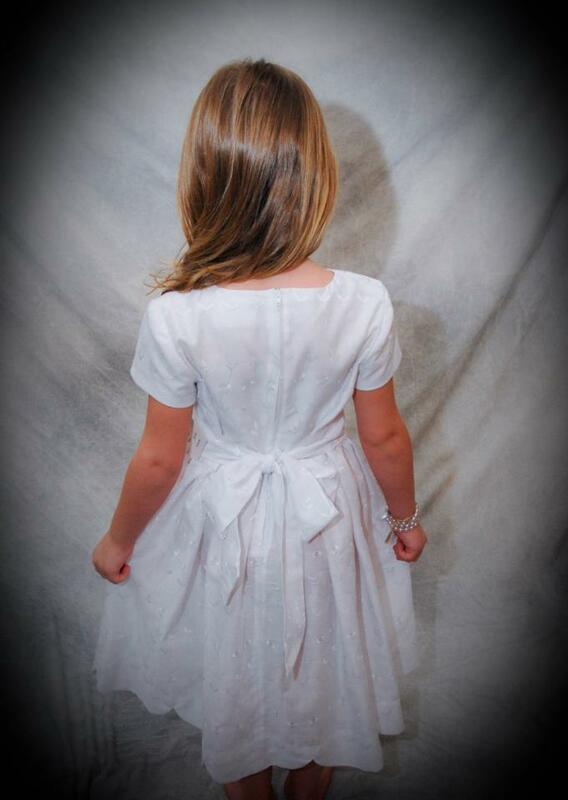 "Robyn" features a scalloped hemline and the simple lines of this dress allow the details of the eyelet to shine....making this little dress something special! 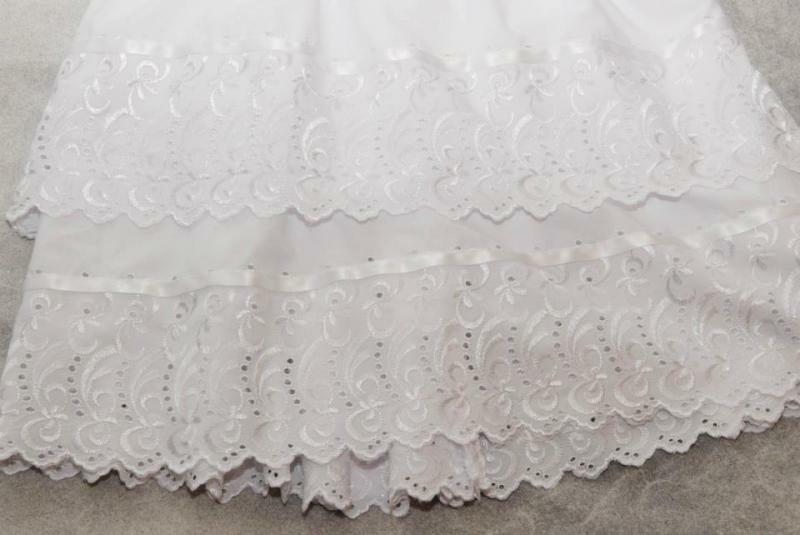 Double edged lace runs along the waistline and the back is has a zipper closing with a GREAT BIG BOW done in the same fabric as the dress! A little butterfly perches at the waistline. So pretty! 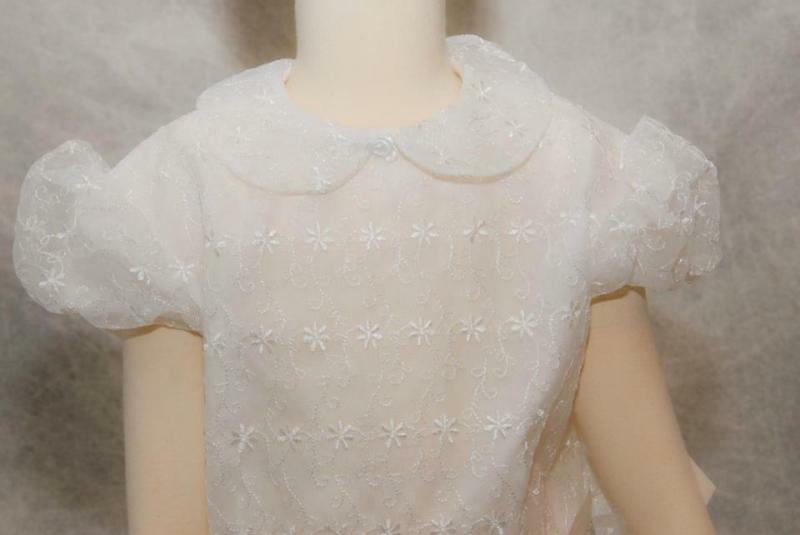 My Mother spent a LOT of time, painstakingly adding pintucks to both the bodice and skirt of the dress we named "Katie". It's just the sweetest little thing! 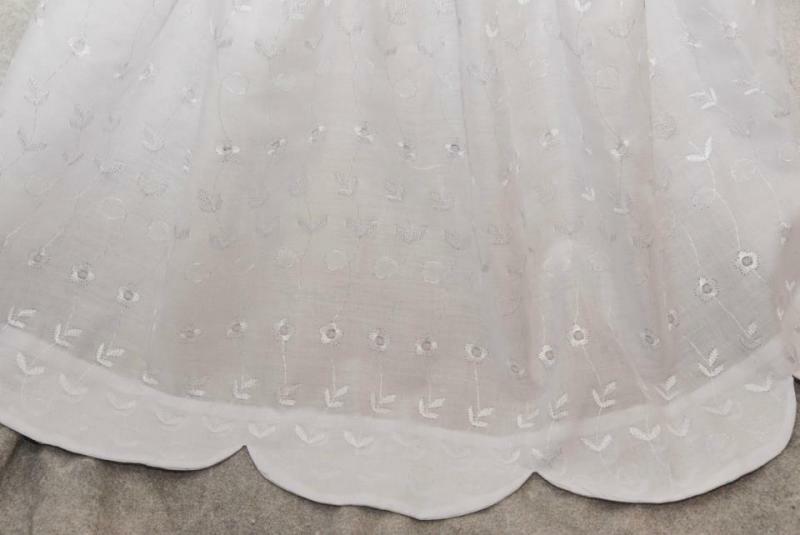 The fabric is a lovely, embroidered eyelet and if that detailing wasn't enough, the sleeves were ruffled and feature the same edging as the skirt. 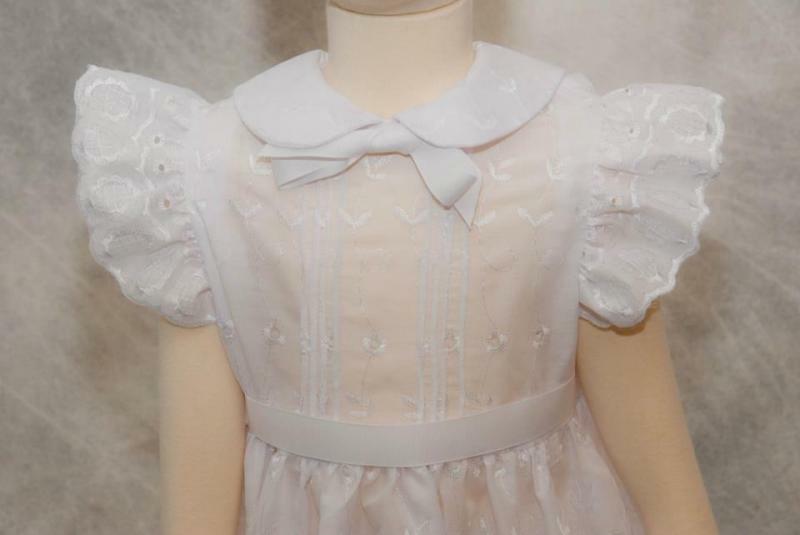 It's finished with a grograin ribbon at the neck and ties at the waist with the same ribbon. All that was needed to finish, was our butterfly! This dress is guaranteed to make you smile! This design is beautifully sweet and perfect for really warm climates! 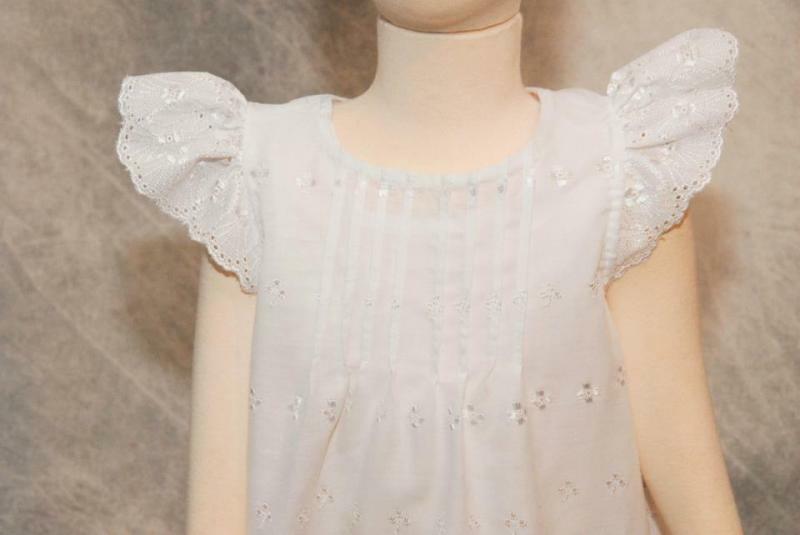 The pintucked bodice compliments the ruffled cap sleeve. 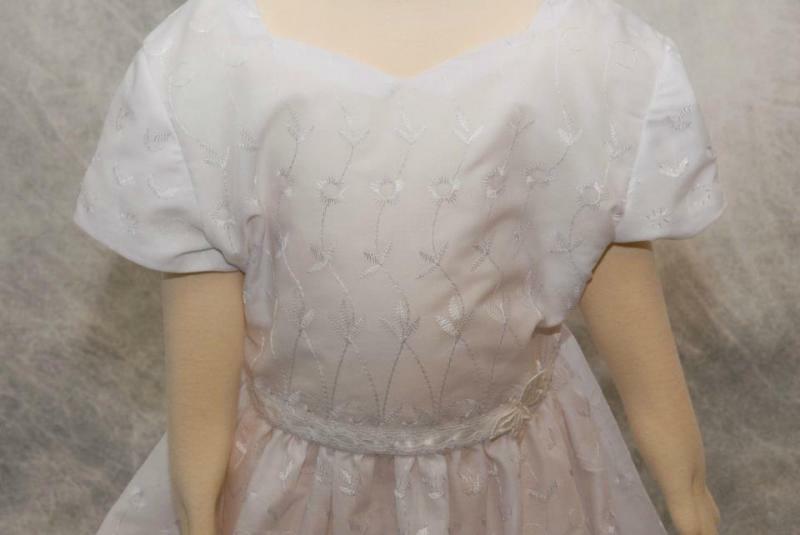 The edging on the sleeve is the same as the hemline. 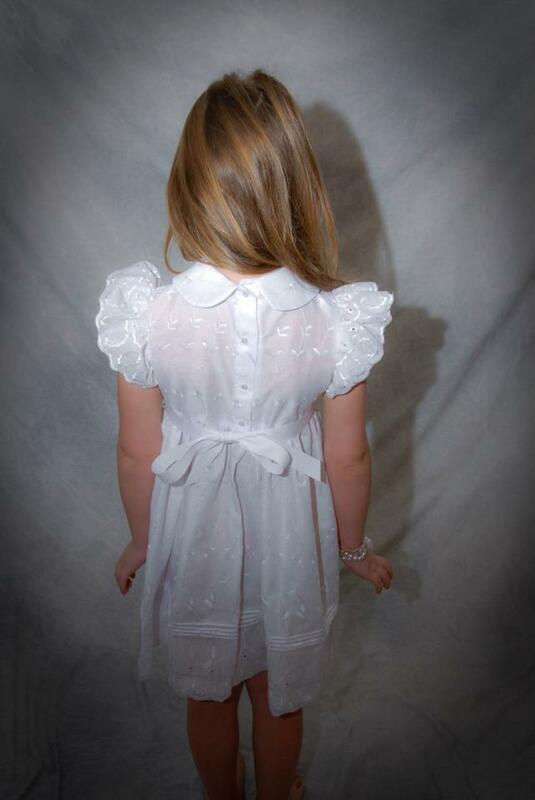 Other than our signature butterfly, we added no other trims as this lovely fabric stands on its own! 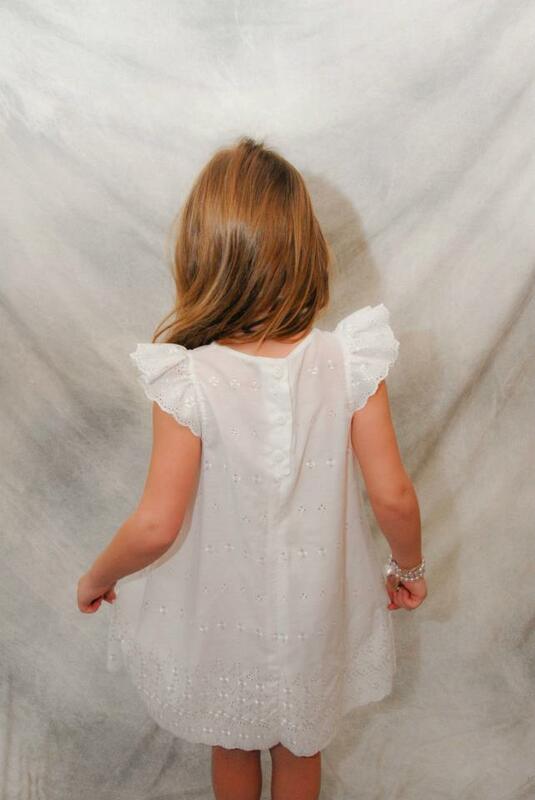 A little slip is included in the cost of this dress! 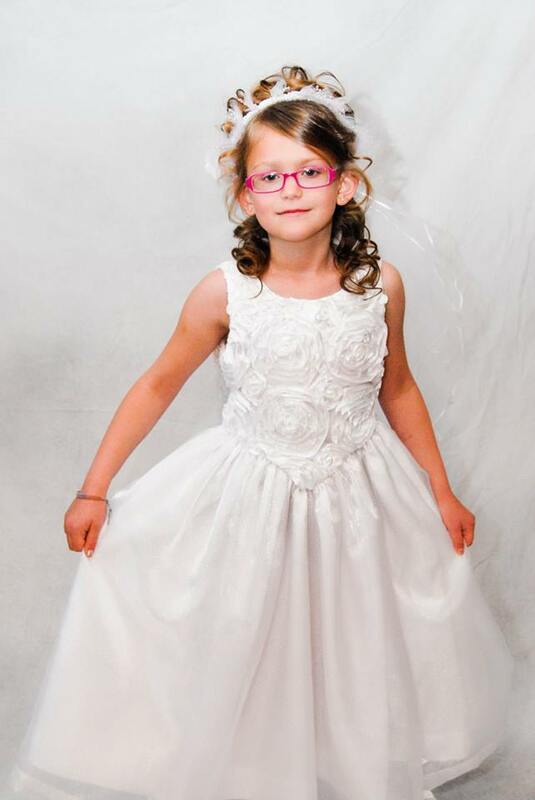 My lovely little model (Aubrey) made her First Communion recently and I was honored with the opportunity to make her gown. This was the result! 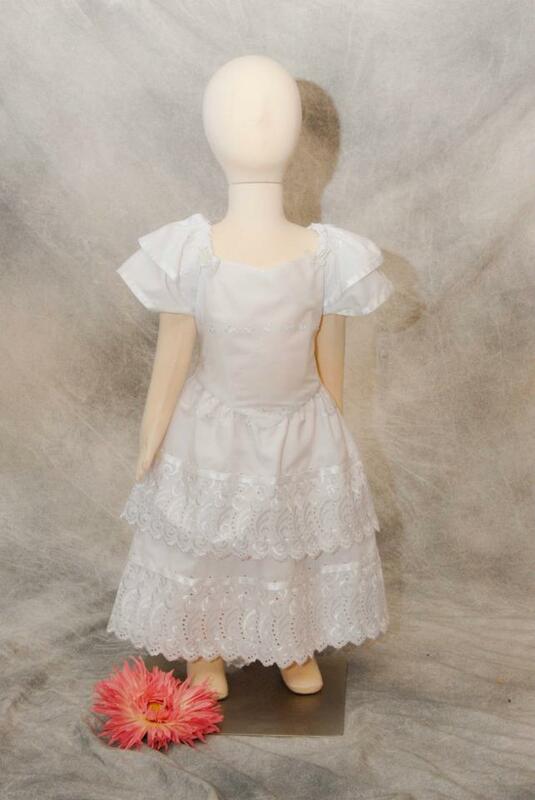 Simple in the overall design, the dress was made uniquel by using a beautiful floral fabric for the bodice. The detailed "petals" of the roses added that very special touch. 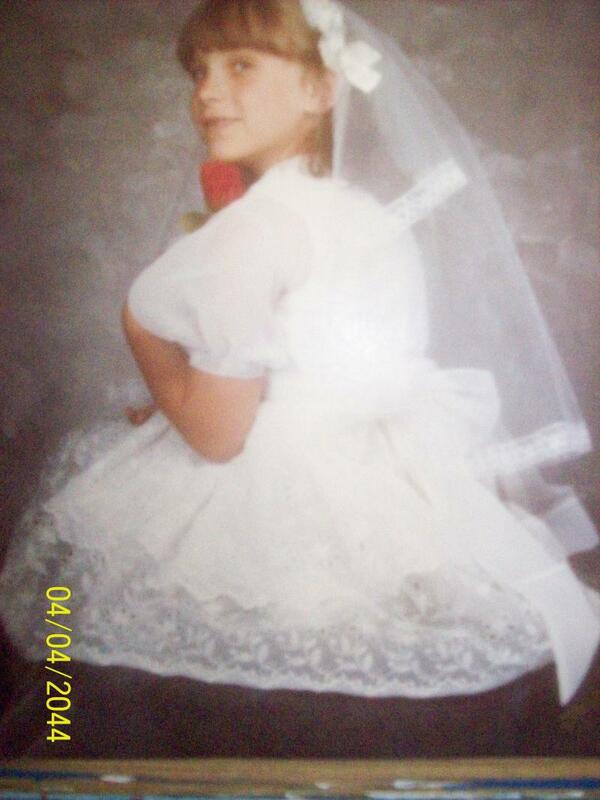 The skirt was a sheer, sparkle organza over a sateen cotton. 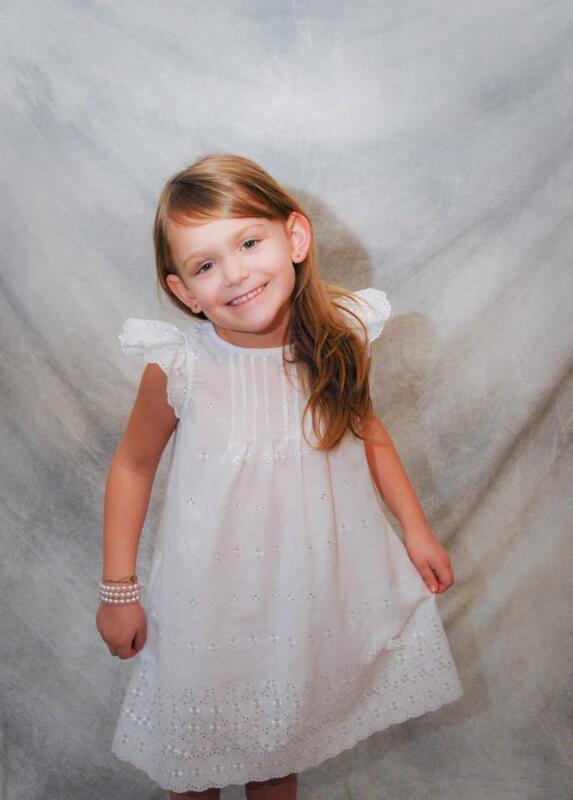 The bodice is lined to keep Aubrey comfortable as she wore it! 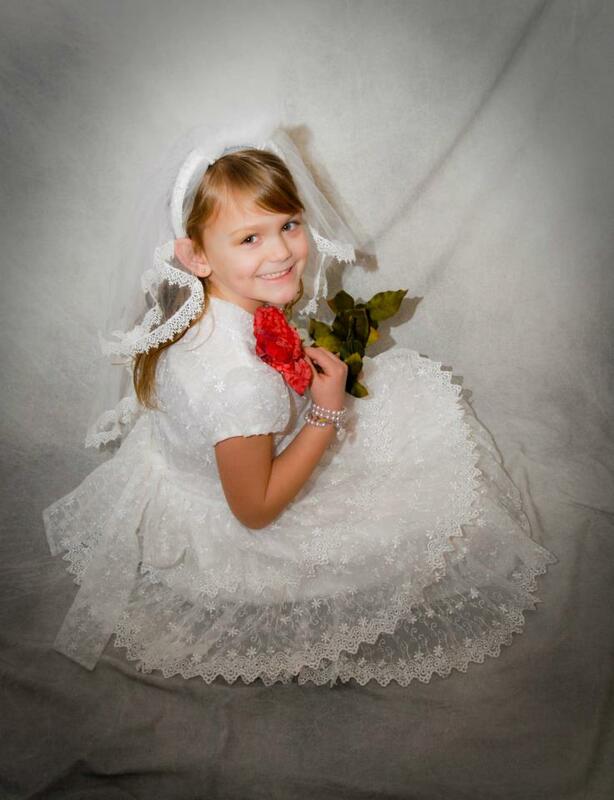 Her Grandmother made her gorgeous veil. 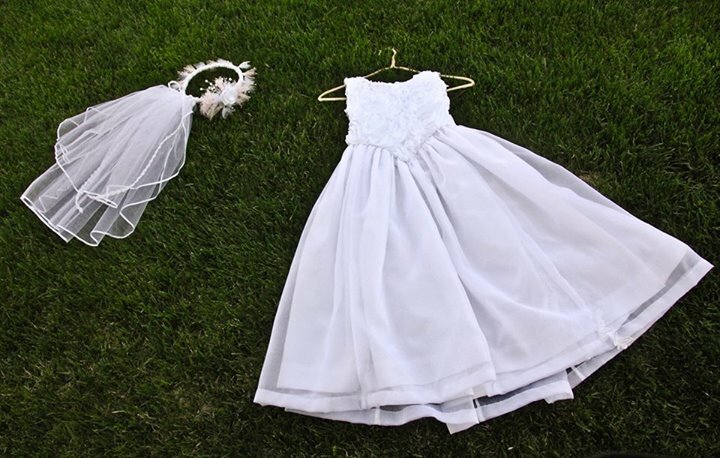 I can create a similar gown for YOUR little girl! I was lucky to find several vintage patterns and was able to duplicate the dress my Mother made for my Sisters and me so many years ago! The original was lost when my sister's home burned down. In honor of Mom, that will be the first one made. 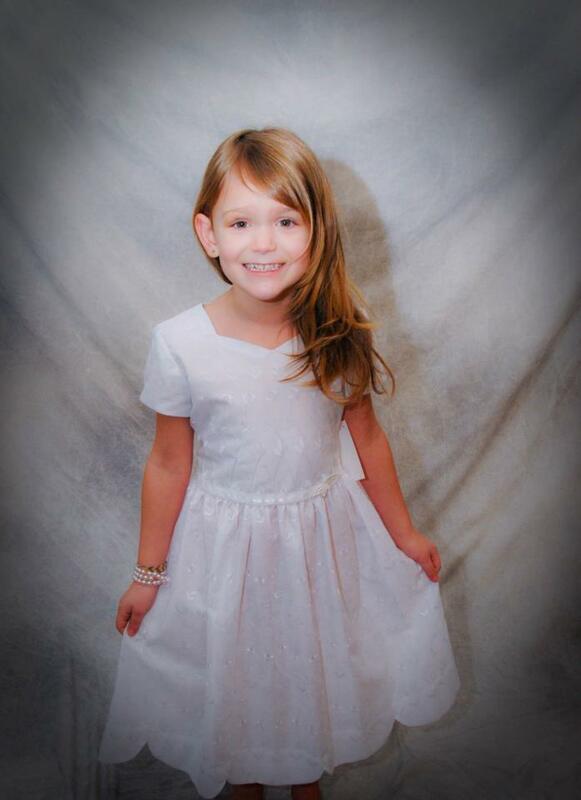 Here is how the dress looked on my daughter, Heather! 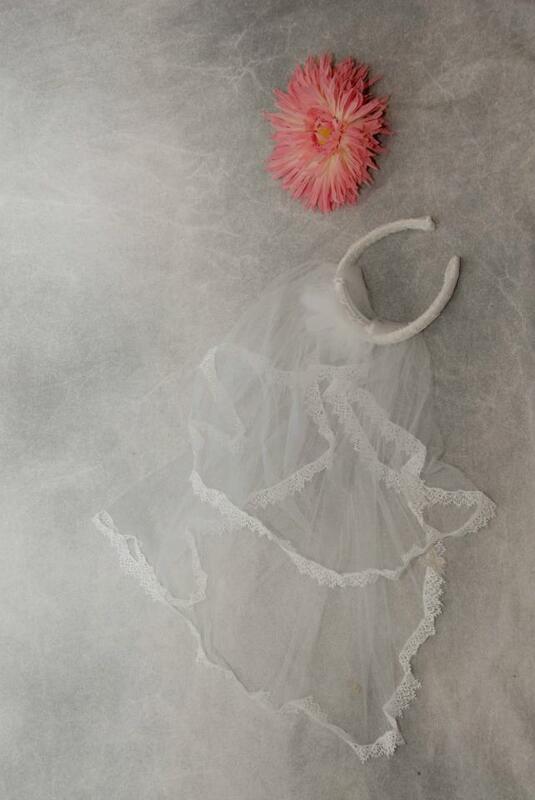 The headband for this veil is covered in the same organza as is the dress. 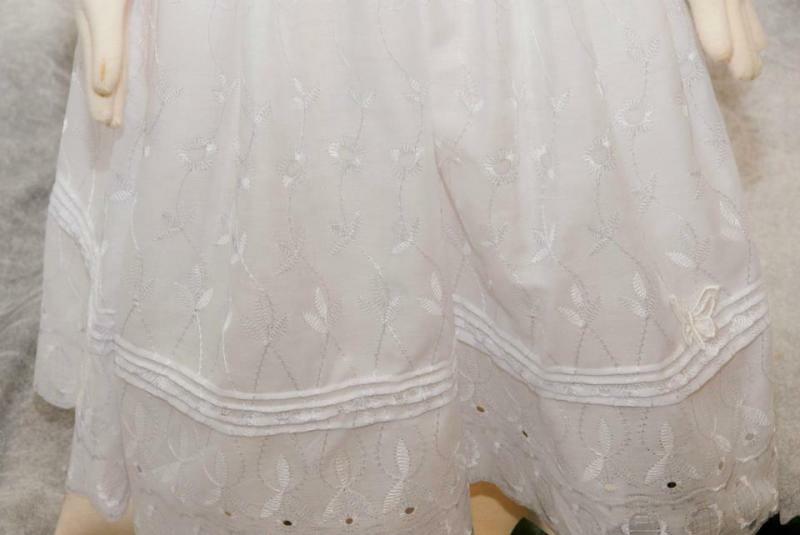 It's trimmed in a satiny lace that picks up the detailing along the hemlines as well.